The new schedule of Ram Charan’s upcoming film Yevadu began recently in Hyderabad. Shruti Haasan is playing the lead role in this film and Amy Jackson has been roped in as the second lead actress. Few days ago, Ram Charan had wrapped up a major schedule of his upcoming Hindi film Zanjeer and Shruti Haasan was busy with the shoot of Balupu. Couple of days ago, Ram Charan flew to Pune to join the Telugu Warriors team in their crucial match in CCL. Now that he’s back in Hyderabad, he has begun shooting for Yevadu. 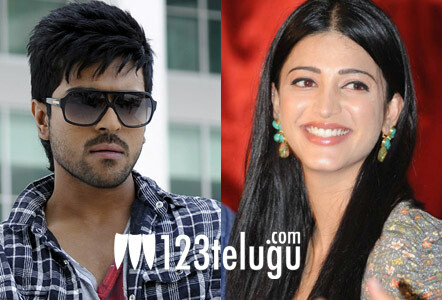 Currently, some scenes are being shot on Ram Charan and Shruti Haasan in a college in Hyderabad. Vamshi Paidipally is directing the film and Dil Raju is producing it. The film also stars Allu Arjun and Kajal in important roles. Devi Sri Prasad is scoring the music.